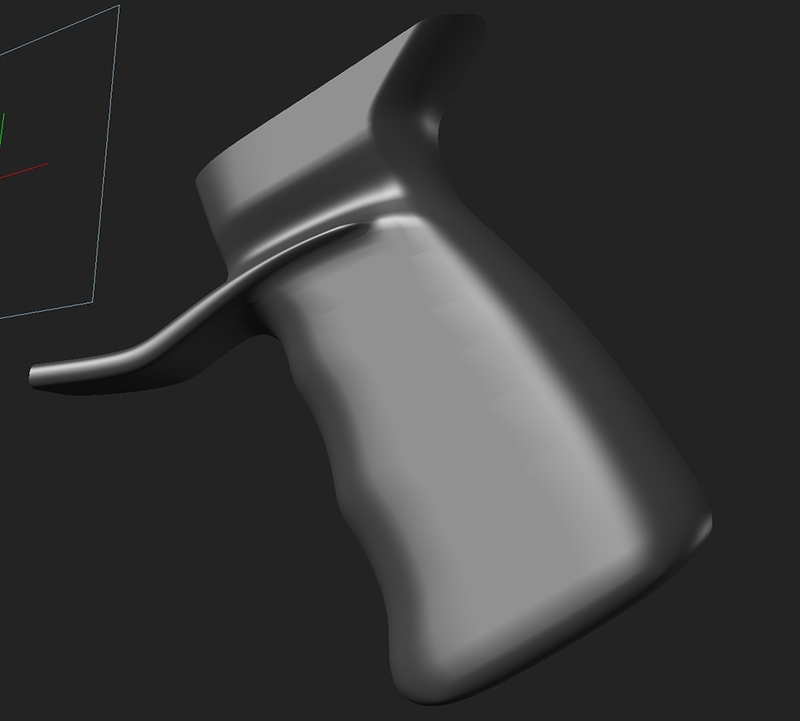 Under "Surface" -> "Subdivision" i set the options to 24 Subdivisions, but it still looks like "1 or 2 TurboSmooth Iterations"
The other thing was that i had to find out how to make the mesh Transparent to see the MP5 Handgrip Reference. I googled a lot, and at the moment there is no integrated X-Ray View for Meshes, or? So i made a workaround by setting the "Transparent Amount" under Material Trans to a high value. 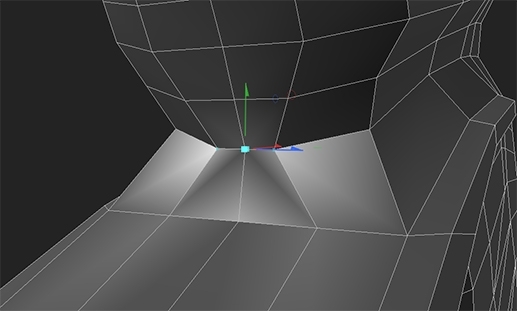 tab = regular subdivision, shift+tab = psub (better smoothing). Shift+d to apply a subdivision. Each type has it's own options in Surface > Subdiv for levels, so make sure you're using the right one (you should see the GL count increase). By default I think + and - on numpad alter the regular subdiv level. For xray there is Overlay Drawing (O -> Drawing and Control) but I just use wireframe for that stuff. I checked Overlay Drawing but nothing happened. I googled it and the people say that this option is for Non-Geo Things. Whats your Workflow for this? Something else is this little Plane, inside my Reference Plane. When i grab for example the X Axis and move it, the Picture of the MP5 moves. 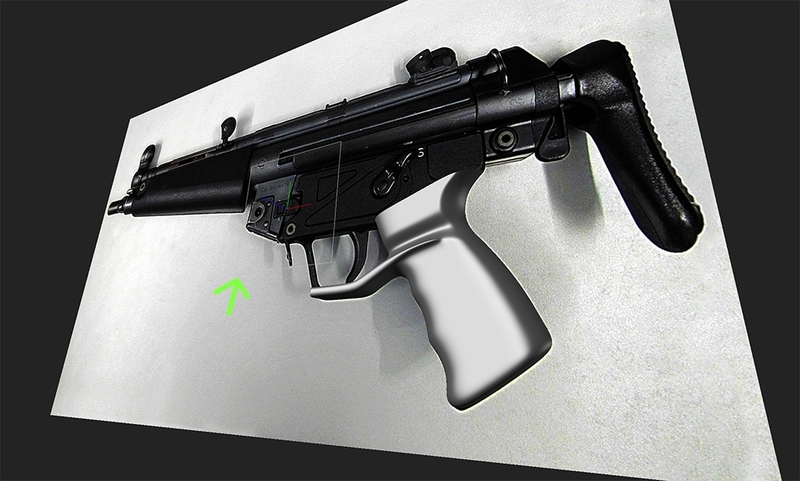 It was created while i dragged and dropped the Picture of the mp5 to the Plane. It disturbs a bit and i dunno how to remove it, without to remove the ref picture itself. But its my second day in modo. I think that in about 2 or 3 weeks everything will be fine. Edit: Ok this Plane dissapears when i hide the TextureGroup. x-ray is just your mesh with transparency, right? That's what overlay drawing is, when you have a backdrop item visible. But like I said I just use wireframe view rather than that. If you aren't already aware the ctrl + (~, spacebar, tab, 1, 2, 3, etc..) keys contain pie menus for a lot of common actions, like switching wireframe, camera angle, ui layout), so you'll be using them a lot. And the alt+ (w,a,e...) shortcuts for action centers are worth learning early too. As for the the plane, not sure what you did to see that, it reminds me of a drawing option you can add to locators, but I'm not sure. Try toggling locators off (ctrl+1 pie menu > toggle locators) and see what happens, or just look around in the backdrop item's properties. Could also try right click > Lock/Unlock on the backdrop item. Yeah im familiar with ctrl +1 and ctrl+space for the viewports. Thanks for the rest Will give them a try, its super fast and cool. Edge Constraint would be awesome in this case. Edit: ctrl + 2 helped a lot. Thanks dude. not sure exactly what you're wanting to do from the pic but it's a safe bet alt+z is the answer (action center > element). With symmetry on. The workplane can also be applicable in cases like this, if you haven't looked in that yet. Yeah so symmetry, element action center, select target edge, move. You´re the best, haha, you helped me so much. 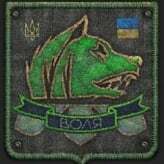 Also the other guys in this thread helped me a lot! There's a Seneca script that does select by angle functionality. The scripts name is lazy select. Why i have to confirm everything with my space bar? I don't quite get your problem but I think activating 'Select Trough' on the top bar might help. I mean that everything i do in Modo has to be Confirmed with the Spacebar. are select trough did the trick for you about spacebar confirmation? When select trough mode is activated, you can select other elements without dropping rotate,transform or whatever tool. answer to your newest quesion is easy. Use slide tool under edge tab. There's two modes. Linear and Radial. One of them works better in some cases. 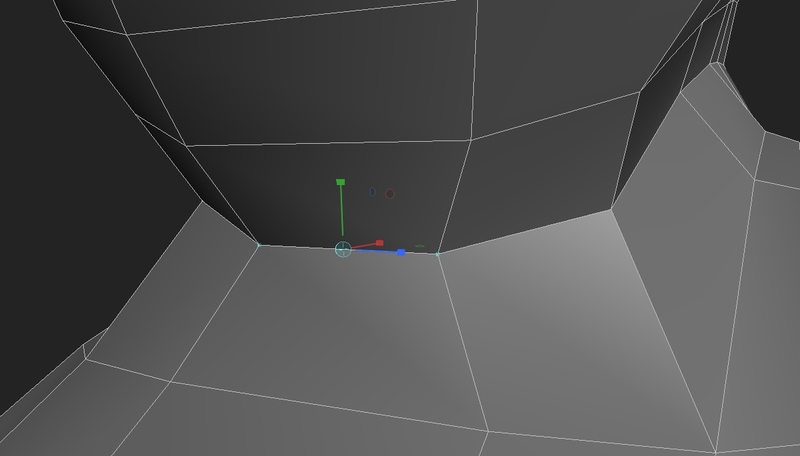 You can slide vertices by same slide tool too. There's also preserve curvature option, when checked modo will slide selected elements while triying to preserve your meshes surface curvature. Can i tell slide to keep the shape of the left border while moving to the right? I want some kind of "perfect" support loop" for the left side. I dont want that the support loop makes a transition to the right border shape while moving to the right. And thanks, Select Through helps. With that active i dont need to confirm every step with the SpaceBar. I don't think such command exists under slide tool. But sliding with preserve curvature option might help regularize your subdivided result. 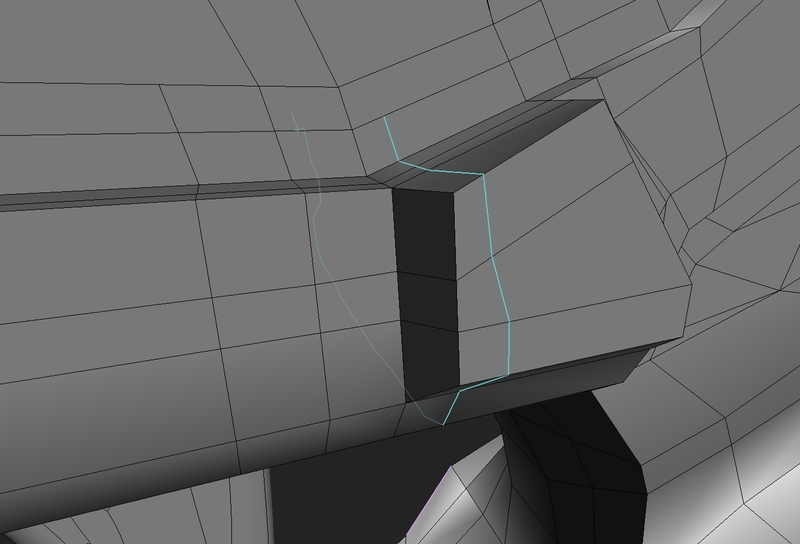 Try to slide it with preserve curvature on while subdivision is on and see the difference yourself. 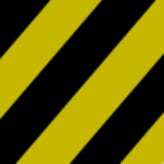 If you need this cut for unsubdivided cage model to continue on building some shape then tough luck. When all fails then there's usually a script about it. Actually scripts are an essential part of modeling in modo. where can i control the Subdivion Level of a Fusion Mesh ? 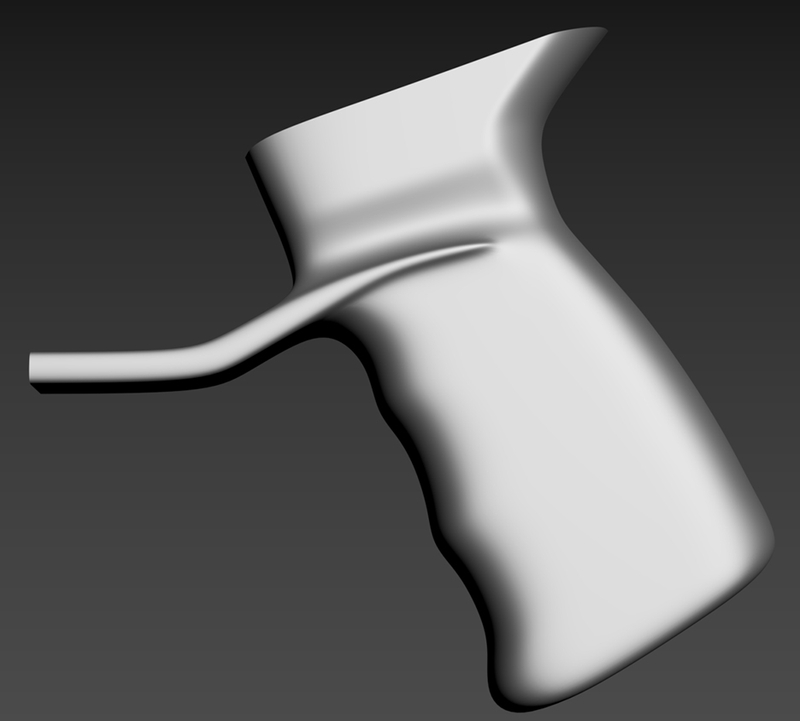 Right now it looks like TurboSmooth with 1 or maybe 2 iterations. I like to have it on 3 or 4 for the Mesh Fusion Item.